Is Your Home a Victim of Updating? Restore Some Charm With These 6 Tips. Over the years, most historic homes have been renovated, refurbished, or edited in some way. In many cases, original features that gave the home essential period details may have been removed or changed. If you’re thinking of purchasing a historic home that has been given an unfortunate facelift, there are ways to gently place the charm back. Before you start any project, research your home’s style and era. You don’t have to follow any rules, but it might be a good place to start and to get inspired. Check out this Tinyprints blog post to see a century of home-decor evolution. Houzz and social network Pinterest are also great resources, but be warned: These websites can be addictive! There are several types of decorative moldings that are not difficult to install. Bob Vila of “This Old House” and “Bob Vila’s Home Again” fame offers an informative slideshow on his website: Know Your Moldings: 10 Popular Trim Styles to Spiff Up Any Space. Here you can visually learn the difference between cove, crown, and dentil moldings. 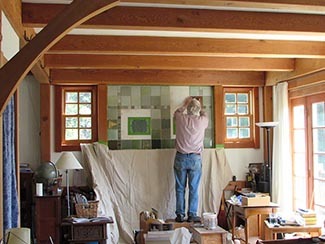 Vila’s website also includes video tips on installation. There is nothing more impressive than well-constructed, attractive, and functional built-in bookshelves. Do you suspect your house used to have some? Don’t fret — you can install built-in bookshelves, either yourself or with help from an expert. Head on over to HGTV for an inspirational gallery of 10 beautiful built-in ideas. You can’t just go and add a fireplace to your house. Well, that’s not entirely true, because you can install a fireplace in a home, but the question is whether it makes sense, financially and aesthetically. But if you are lucky enough to already have a fireplace, you can restore it to its original glory. That brick fireplace can be renovated by simply cleaning or painting the bricks or replacing them if necessary. Here is a guide on how to restore a brick fireplace from SFGate. Houzz and Remodelaholic also have some inspiring photos. This happens often on reality TV shows: The first thing that home seekers do is pull up the carpet to see what kind of shape the original wood floors are in. And for good reason — wood floors add charm and character. There are plenty of wood-floor variables, from the size of the planks, the type of wood, and the color/stain of the wood. Hardwood floors do not collect dust and dirt like carpet does, and they are more durable. Ready to pull up that carpet? See this guide to restoring hardwood floors under carpeting on the This Old House website. Here’s an idea that is a bit lower down on the commitment scale: You can give furniture an antique look by distressing and staining it. Voila — instant charm! Distressing adds an aged look and works well with a variety of rustic decors. Here is an easy guide to distressing furniture from HGTV. Restoring charm to an older home can be a challenge, but your efforts will definitely pay off. Not only will you enjoy your charming house, you will be adding value to your charming investment.